(2) supporting STEM teaching through strengthening partnerships with and among PD practice. STEM PD net is subdivided in seven different areas of work (so called outputs). O1: Quality criteria for PD and how to implement them in day-to-day professional development for teachers. This part of the project focuses the development of a research-based guideline for high-quality professional development (PD) in the STEM areas and beyond. The aim is to provide a ready-to-use guide for PD providers which outlines current problems with professional development in the area of STEM education, provides research-based quality criteria for high-quality PD, and also provides concrete examples on how to implement these general recommendations in day-to-day PD practice. Go to Ready-to-use Guide for High Quality STEM Professional Development. This part of the project focuses the often neglected complexity of evaluating the short- and long-term effects of a particular professional development initiative. Evaluation of PD programmes are often restricted to the level of contentment and happiness of participants, and a broader set of evaluation approaches needs to be elaborated. The aim is to provide a ready-to-use guide for PD providers which outlines the challenges in evaluating PD effects, presents and values standard methods for evaluation and innovative, formative, methods built into the PD activities, and gives recommendations for a feasible and purposeful evaluation of PD courses, including evaluation of impact on teachers effectively using innovative approaches that include dealing with diversity. O3: Taking advantage of diverse learners: Jointly facing the challenges towards improving STEM education in Europe. This part of the project focuses diversity in STEM classrooms concerning for example socioeconomic background, competence level and migrant background. Teachers experience big challenges in dealing with the situation and providers of professional development for teachers need to cover diversity in their activities and programs. The aim is to provide a catalogue of appropriate lines of action for PD providers in order to support teachers in using integrative approaches in STEM teaching. The catalogue will elaborate current challenges in dealing with diversity in STEM classrooms, show good examples on how to teachers can deal with diversity in that context, and show good examples of PD activities and organizational development of PD centres that can offer opportunities for teachers to meet the challenges and affordances of diversity. Go to Culture, Equity and Diversity in the STEM classroom. This part of the project focuses materials for professional development (PD) in the STEM area, ready to use for PD providers. Relevant existing materials will be identified, presented and commented. The aim is to provide a ready-to-use material collection for professional development in the STEM area. The collection will be commented in relation to the quality criteria for professional development identified in another intellectual output of the project. The collection will also be accompanied by basic information about the presented materials (for example purpose, content, target group, and available classroom materials), comments on teaching approaches promoted and whether diversity is addressed, and PD providers’ experiences of using the materials. O5: PD centre models: context, mission, structure and activities. This part of the project focuses models, challenges and success factors to lead improvements in STEM teacher professional development. 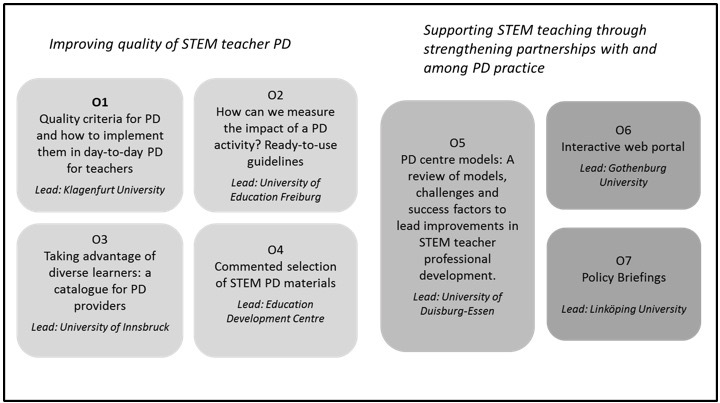 The aim is to provide an accessible and illustrative compendium describing the different possibilities available when setting up a centre for professional development (PD) in the STEM area. The compendium will include a structured overview of possibilities of PD centre organization and activities, selected descriptions of PD centres with examples of their activities as well as an analysis of their weaknesses, strengths and challenges, and a review of challenges and recommendations on developing influential PD centres and possibilities to overcome challenges. Go to Compendium on PD centre models. This part of the project focuses information about the project and the associated network of centres for professional development (PD) in the STEM area, and dissemination and accessibility of project outputs. The aim is to provide a web-portal which will contain information about the project partners and about associated STEM PD centres, project progress reports, information about past and upcoming dissemination events, and all materials produced as intellectual outputs in the project. This part of the project focuses the relation and cooperation between policy makers and centres for professional development (PD) in the STEM area. The aim is to convey the STEM PD centre network activities and key messages to policy makers. This will be accomplished through three kinds of policy briefings. The first kind will present background and rationale for setting up the network, and the possibilities the network offers for policy makers. The second will present different models for STEM PD centre organization and activities. The third policy briefing will deal with implementation of PD in the STEM area and how quality in PD initiatives can be assured and measured. Go to Introducing STEM PD Net to Policy Makers, STEM PD Centre models, Implementing and measuring quality in STEM teacher Professional Development.